TIP: You can add wood chips to a smoking pan to get more flavourful results. Combine all seasoning ingredients and mix into a paste with a hand blender or small food processor. Rub seasoning all over the bird, spreading it around as much as possible; put any extra inside the cavity. Place the turkey on the barbecue and cook using one of the two following methods. 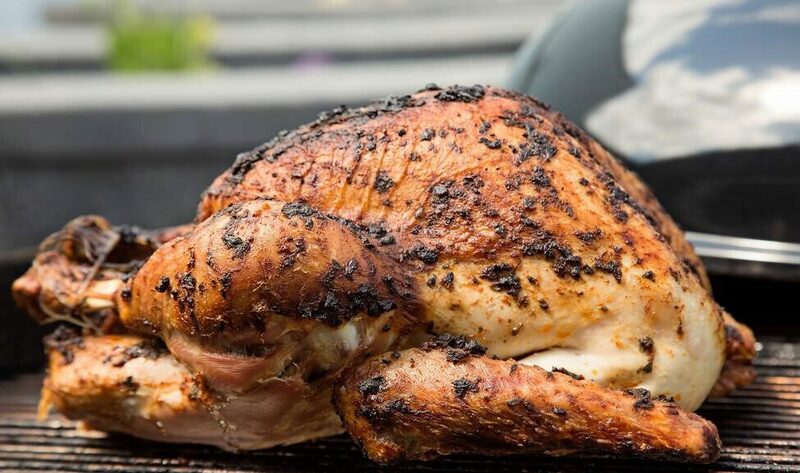 A meat thermometer should read 170°F (77°C) when the bird is done. Charcoal Barbeque Method: Build up hot coals around a drip pan place in the centre of the barbecue’s bottom section. Place turkey directly on the grill over the drip pan. Cover, open all vents and add extra coal as required trying to maintain a BBQ temperature of 325°F – 375°F (160°C - 190°C). 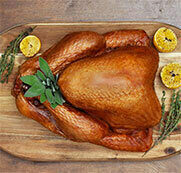 Gas Barbeque Method: Roast the turkey in a shallow foil pan either on very low or indirect heat. The barbecue should remain covered during cooking. Try to maintain a BBQ temperature of 325°F – 375°F (160°C - 190°C).